After our late night with the long-winded opera singers, Colin decided to stay home and sleep in this morning. By the time we really got going, it was time for lunch, so we decided to indulge our craving for "real American food" by trying the diner in the 5th. 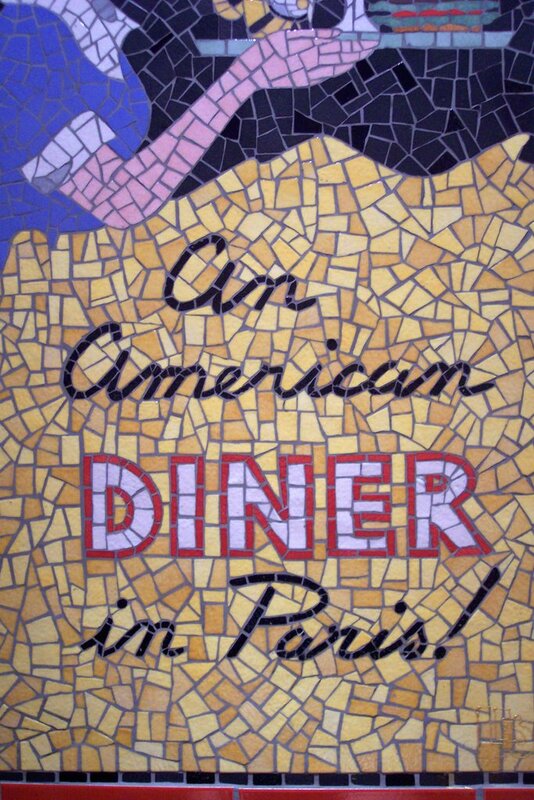 Known as Breakfast in America, this restaurant proudly proclaims its status as a "real American diner in Paris." After reading through the menu online, I was practically drooling with anticipation. After lunch, we met up with Rachel and headed over to the Musée Rodin. It is really a lovely place -- just big enough that you are satisfied with the amount of stuff you see, but not so big that you're tired before you're finished. Of course, I am a big fan of Rodin's sculptures. 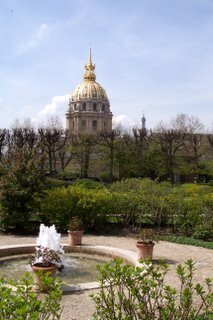 After my trip to the Musée d'Orsay, I realized that no one can hold a candle to his work. We got to see "The Thinker" in person, as well as "The Gates of Hell" and "The Kiss," all among his most famous works. Of course, there was the usual requisite number of illiterate people who apparently didn't understand any of the languages requesting that no one touches the statues. Sigh. But, I decided not to let it bother me. The weather was just spectacular outside, so it was hard to be in a foul mood. After we toured the museum, we sat outside at a café for a while and just chatted. It's so great to have nice weather again. Of course, half of all of the Parisians are wearing coats and scarves as if we were in the middle of winter. (Doesn't anyone watch the weather report around here?) Rachel and I also hit a couple of sales in some nearby clothing stores so that I could have something else to wear besides printed t-shirts that I got in college. I finished the day with a stroll around the neighborhood with wild-man Didge, who tried (and nearly succeeded) to run in every direction at once. He's a bit happy about the nice weather, too. For those expats who are craving a taste of home, I would recommend Breakfast in America. 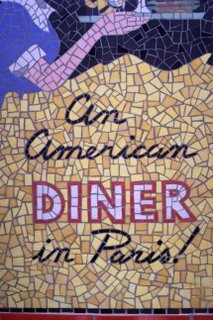 The atmosphere is as much like a good-old-fashioned American diner as you can get in the Latin Quarter. There's the typical French terrace and the bar is stocked with a nice variety of alcohol. Some kitsch scattered around on the walls, but no calendars (the crucial factor for Bill Trogdon!). Of course, the diner is only three years old, so I guess we need to give them time to collect their kitsch and calendars. Amy's a little harsh on the burgers--I had a "Super BIA Burger" (anyone else think of BIA as something completely different?). 1/3 pount of beef that was juicier and more flavorful than any other beef I've had in France, buried under sauteed peppers and onions, with a couple strips of bacon and barbecue sauce (Texas style, but with a really nice flavor!). The milkshake was an honest-to-goodness American milkshake, even if it wasn't the thickest shake I've ever had. What makes it American? Ice cream. When you're in France, you will often see "milkshake" on menus. But it's literally what it sounds like: agitated milk flavored with chocolate, strawberry, or vanilla. So, a good place for expats. Don't go there if you're a tourist, however. Avoid it like you should be avoiding McDonalds and KFC!